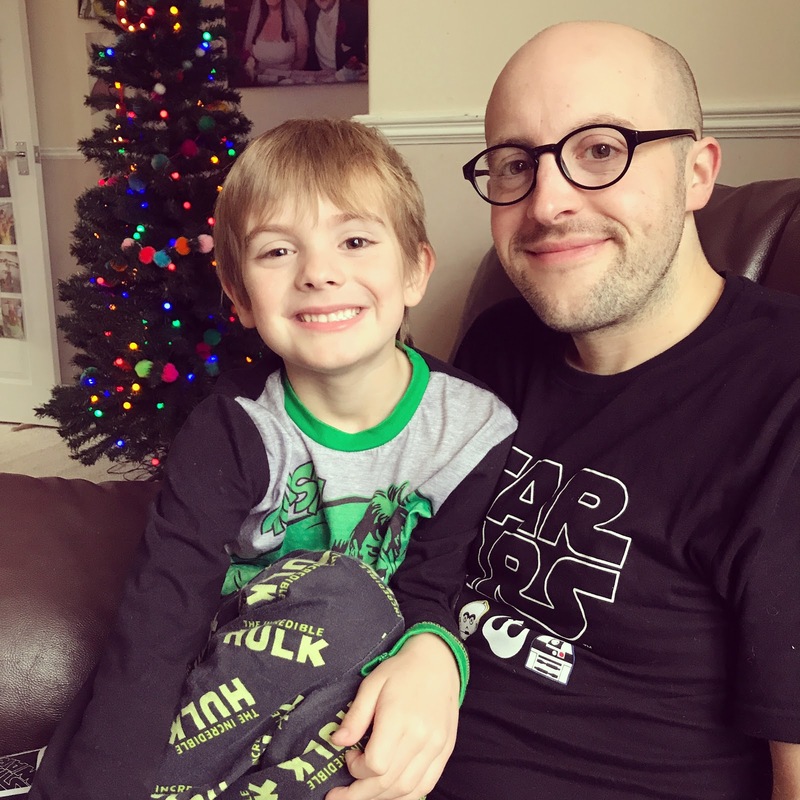 Well, it's been a little while since I've managed to sit down and take five to write a blog post on my own blog. Life it seems has got just a little bit crazy. 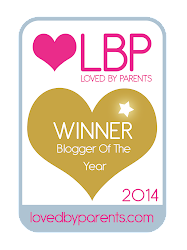 I think most of my blog readers (if there are any of you left!) will know that back in May 2015 I took the plunge and started my own social media management and PR consultancy. It was a big gamble for me, and something I had been considering for a long time, it was super scary to leave behind a career in teaching, but in my heart of hearts I knew it was the right thing to do. Fast forward almost four years, and I'm very pleased that the business is going from strength to strength. I'm super fortunate to work with some amazing people, have a lovely full list of clients and most importantly, I am making a career that works better for me and my family. I'm very lucky that on the whole I do enjoy my work; I love the challenge, to feel useful and to be creative, I like being uber organised and having a daily 'to do' list, and most of all I like the freedom of being my own boss, working my own hours to suit family life, and of course, earning a living in the process! The major down-side however to this self-employed life I now lead, is how much of a time-sucker it is, and how much more of a juggle my life has become. I mean, it doesn't take a rocket scientist to work out that juggling two kids (one who is still at home full time with no childcare), one at school and all that entails, plus a career that currently consists of working for/on 11 different clients/projects, a house to clean, clothes to wash and relationships to maintain, that life is full on and sometimes I feel like I don't know if I'm coming or going. It has also meant a LOT less time for myself, far less time to cultivate my many varied interests and hobbies, and in turn hardly any time to pour into my own blog and social media. What is it they say about plumbers having the worst heating in their own home, and electricians having broken lights and appliances? It's like that with me - I spend so much time doing everyone else's blogs, social media platforms and PR, that I have no time, energy or inclination left to do my own! I don't want my little corner of the internet to die a death though, and so I am going to try to find time to readdress the balance a little, and fit in some chunks of time for myself again. I need it. 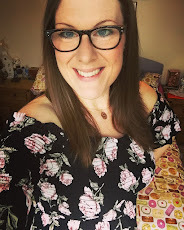 I've come to realise the longer I am without it that I crave an outlet, albeit this blog, or a creative project for myself (I love crafting/sewing etc) and I need some of it back in my life pronto. Not just for my own enjoyment but for my own mental health too, which has definitely been suffering lately. 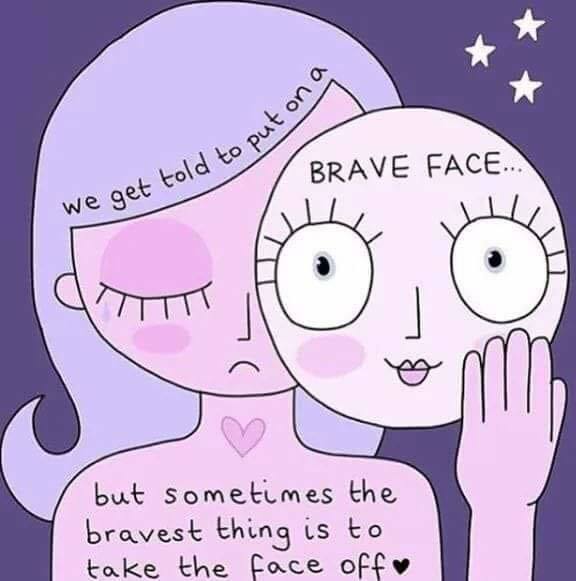 "We get told to put on a brave face...but sometimes the bravest thing is to take the face off." and it really resonated with me. My whole life I've been the Queen of Putting On A Brave Face - stiff upper lip and just get on with it - power through, man up, just keep going, and in turn I've learnt the hard way that sometimes you just can't - you hit a metaphorical wall and you burn out. Over the years I have learnt to recognise the signs of that burn out - and at that point I try and give myself a break: I attempt to avoid stressful situations and emotional triggers for the anxiety I often deal with. Today I hit the wall. I was in tears before 8am because I just couldn't ask the kids for the 20,000th time to get dressed or put their shoes on, or finish their breakfast...I am tired (even after 9 hours sleep last night, which for me is unheard of), I'm worn down, fragile, over emotional, on the edge - and if I don't do something to readdress things I will topple down the rabbit hole I've been down too many times before. 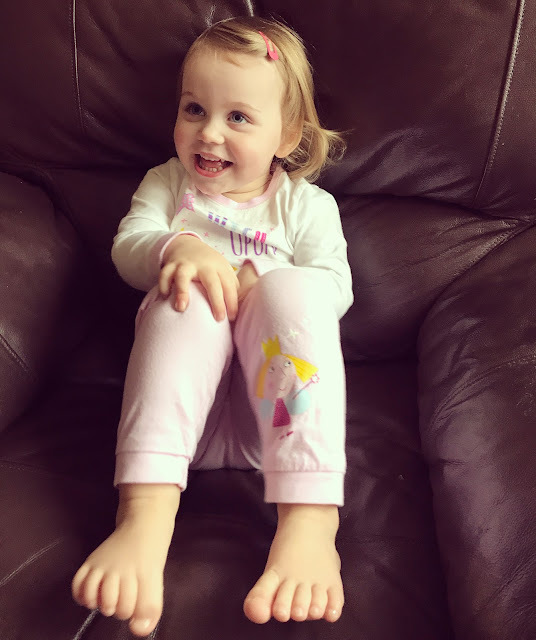 So this rambling blog post is my first attempt in a while of taking off my brave face and saying 'I'm not really okay at the moment'. I know I need to be proactive about making myself feel 'more myself' and getting my mental and physical health back on track. I had a bad shoulder injury for most of last year which really took its toll on me - and this paired with my already terrible lower back (3 slipped discs, joy!) has been hard to bear at times. The constant pain, and being consistently uncomfortable grates and grinds on my physical and mental wellbeing too, as well as the juggle of everyday life. Annoyingly, the same shoulder now seems to have some sort of pulled muscle (separate to my injury last year) which in turn is causing inflammation and a trapped nerve down my arm - with all sorts of weird sensations and pins and needles down my right arm. As you can imagine, this is not helpful when you spend a large proportion of your time working at a computer and chasing after small children. 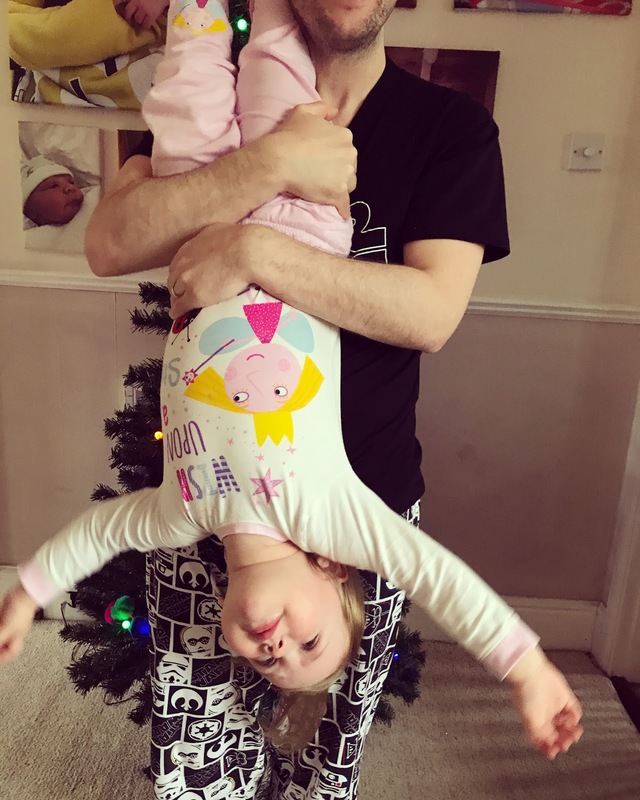 It's also not great for someone like me who suffers from quite bad health-related-anxiety (stemming from when my son Bert got incredibly sick with sepsis when he was 18 months old) ever since then I've had some major issues around illness, getting sick and the worry that either the kids, Liam or I will fall ill. So having unexplained pains and symptoms I've never experienced before, has set off a whole new bout of anxiety related to illness which at times can be very hard to deal with/escape from. Of course, I've seen the GP and he reassures me the shoulder symptoms are most likely caused by a pulled muscle from working out or swimming, or a combination of the two, and that rest and Naproxen will do the trick eventually, and I know I have to have faith that they know what they're talking about, but logic doesn't come into it when anxiety knocks, and so I work hard every day to keep it at a level, and to not let it take over. As well as readdressing the balance for my mental healths sake, I also want to get my physical health back on track - so I have started using My Fitness Pal calorie counting app again, to get some more control back with my diet and to ensure I'm making better choices and hopefully shifting some tiber in the process. Since having Connie two years ago I have crept up to a UK size 14/16, and I'd love to get back into my size 12 clothes again! I have a whole wardrobe of nice things that are uncomfortable or won't zip up, and that's doing nothing for my confidence/happiness and in turn, my mental health. And so for me, I need to make some changes - work is important, and very necessary, but so is my health and happiness and I need to find a way to make it all work together in harmony as best I can. I've had two weeks off of the gym now, and will likely need another week or two, and then I also hope to get back to my twice weekly gym sessions, which are a big factor in keeping my mental health balanced and on-track. The final thing I wanted to get out-there was the topic of mum-guilt. God it is such a real thing, and I struggle with it daily - am I a good enough mum? Am I attentive enough to them? Do I work too much? Do they think I'm neglecting them when I'm doing emails and working for clients while they play or watch the TV? Should I work solely when Bert's at school and Connie is napping and then leave the rest until they are in bed, and in turn lose my evenings with Liam? Do I worry about housework too much? Do they think I am obsessed with tidying and washing? Argh! Daily guilt that genuinely does the rounds inside my brain! I know from talking to friends that I am by no means alone in this, and most working parents deal with the same feelings and emotions on a daily basis. But it is so hard to 'have it all': a family, a career, a happy relationship, friendships, a home you're proud of and your own mental health in tact - it take so much work and cultivating - perhaps it's elusive? A big lie we tell ourselves is absolutely achievable when perhaps realistically it isn't and something has to give!? Whether elusive or not, I am pledging to work harder to get back on track in all aspects of this busy/crazy juggle mum-life. And I wanted to reassure anyone out there still reading that I still care about this corner of the internet and the community we made - I've just been very time-poor and floundering a little. Let's hope this is the start of a more balanced chapter. 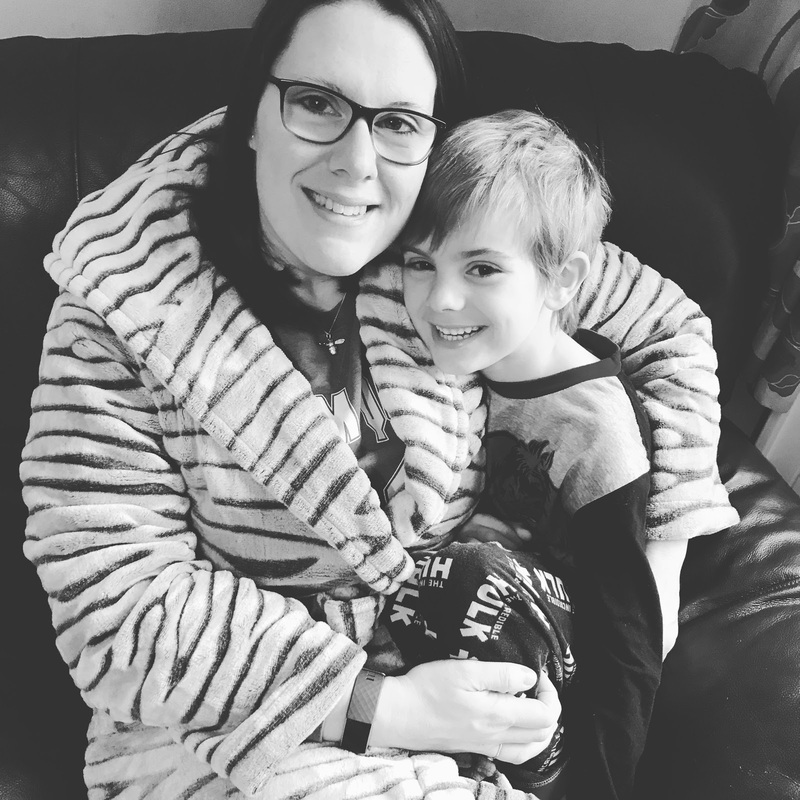 The people over at The Pyjama Factory sent us an awesome little package last week - full with new pyjamas for the kiddies and Liam, plus a big snuggly dressing gown for me! 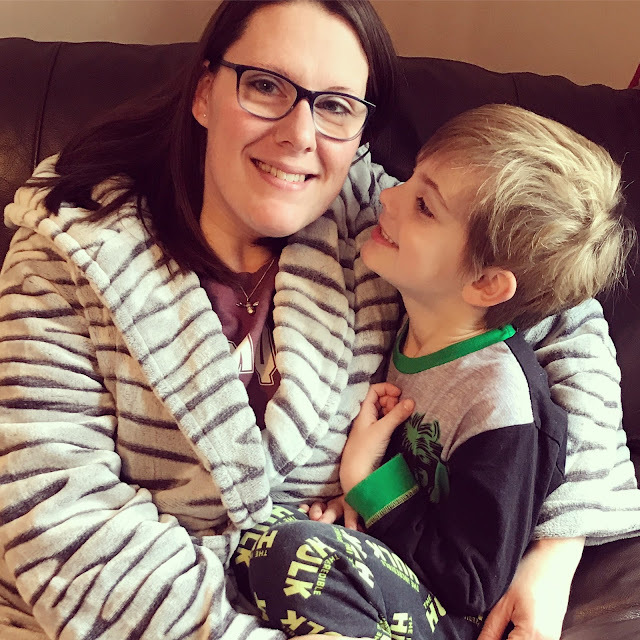 I LOVE pyjamas, and would wear nightwear 100% of the time if I could get away with it - there's nothing better than getting new pyjamas - so I was super excited to feature this lovely brand here on the blog. At The Pyjama Factory they sell an array of pyjamas for babies, children and adults, featuring loads of well loved characters such as: Harry Potter, Marvel Superheroes, Ben and Holly's Little Kingdom, Peppa Pig, Star Wars, Cars, Pokémon, Jurassic Park, PJ Masks and many more. 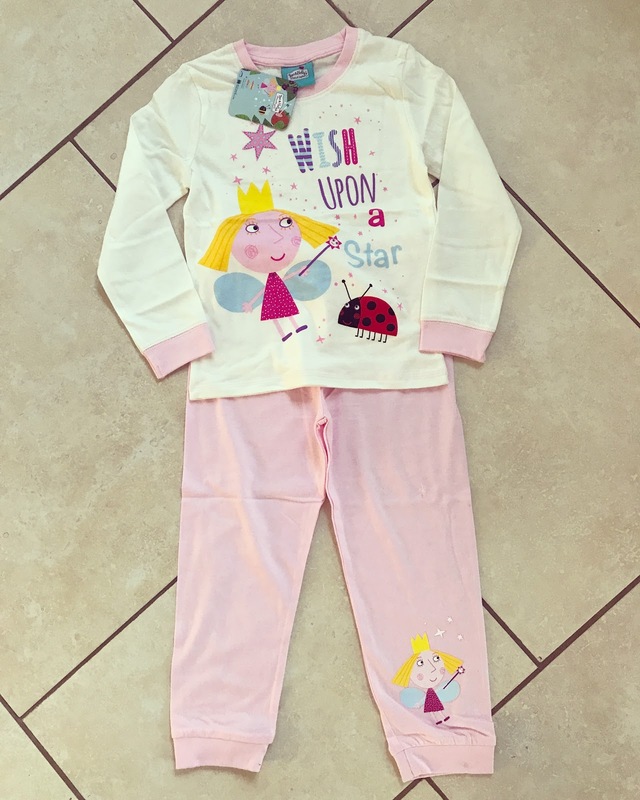 They also sell adorable matching Christmas pyjamas for all the family, which are perfect for this time of year. 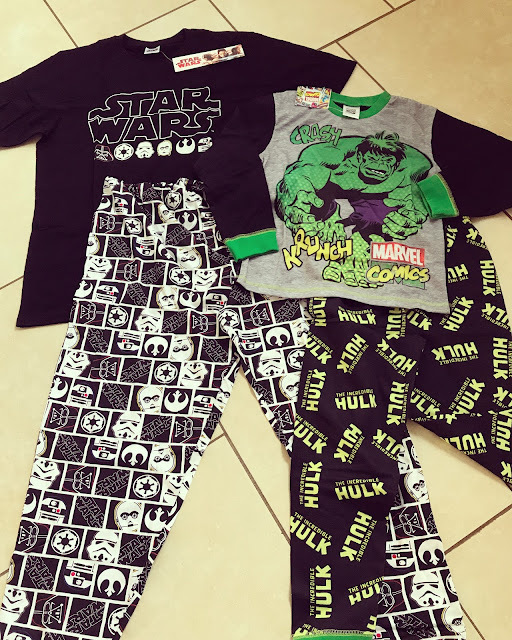 We opted for all-year-round wear pyjamas, and instead of going Christmas themed, we each picked our favourite item from the website - unsurprisingly, Liam picked a Star Wars set of mens pjs, Bert chose The Incredible Hulk (his favourite superhero) and Connie chose some Holly (from Ben and Holly's Little Kingdom) pyjamas. I was massively in need of a new cosy dressing gown, so opted for this rather than new pyjamas. 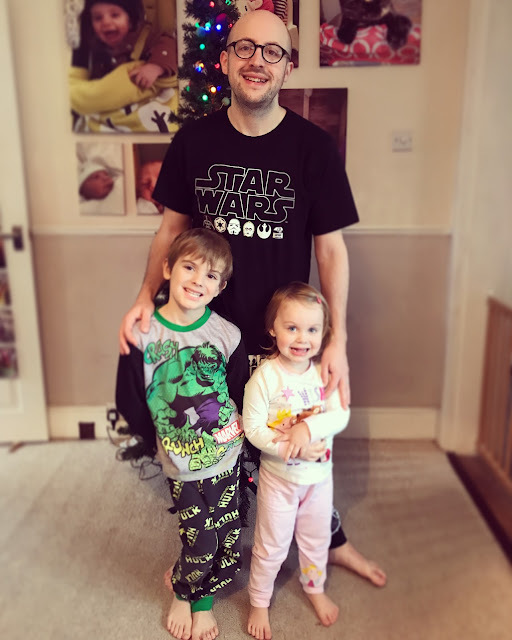 I have to say I am massively impressed with the quality of the pyjamas compared to their price - usually more budget friendly pyjamas would have a cheaper feel to them, but all three pyjama sets we received are great quality, and a good fit too. I always size up with pyjamas for the whole family as we like them loose and comfy - so I got Connie's in age 3-4 (She's a very big 2.5), Bert's in age 7-8 (he's a big 5.5) , Liam a medium (he's usually a S-M), and my robe in a size 16 (I'm usually a 12/14). I'm pleased I went bigger as they all fit well, and will last us a long time! Each set has now been washed and dried too, and they've washed really well, not losing shape, no shrinkage or fading, which is great. 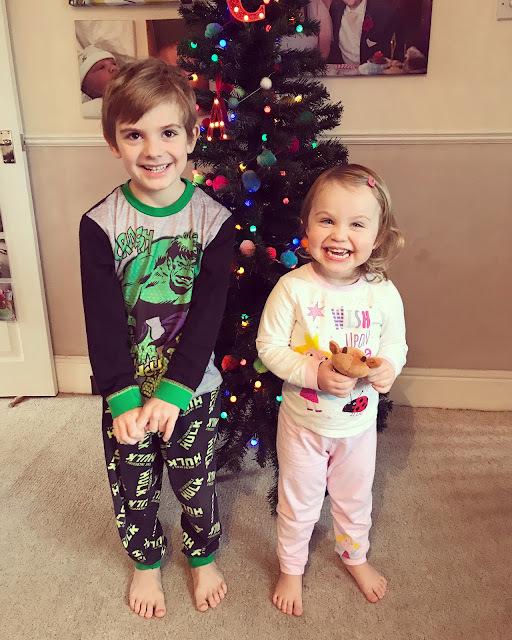 They've quickly become the kids favourite pjs and so I've even had to get them washed and dried in a day, so they can wear them again the next night. Bert's had a run in with a jam sandwich, and came out of the washing machine unscathed too (thankfully, as I hadn't taken these pictures at the time!). 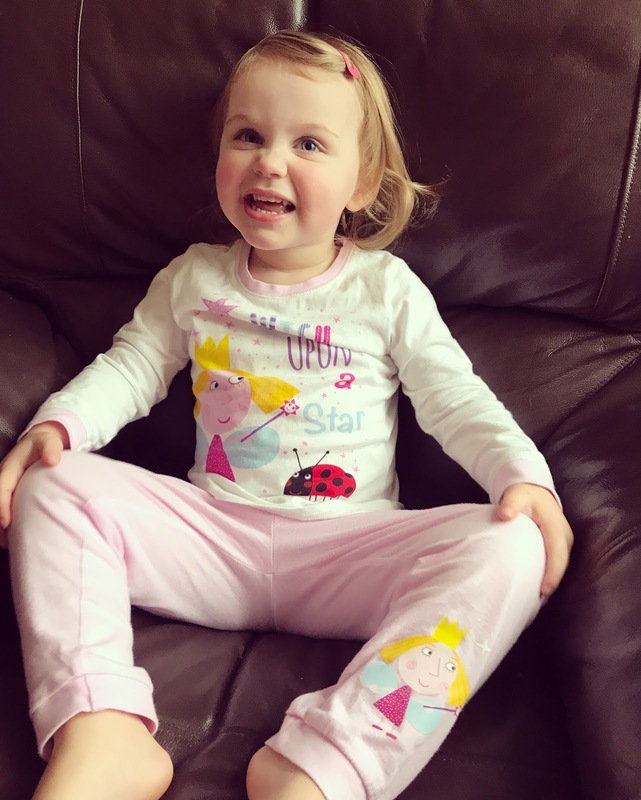 If you're looking for an easy to navigate website, that sells great quality pyjamas for the whole family, then definitely go and check them out! The delivery was super-swift and FREE. Our total order should have cost a few pence shy of £58, which isn't bad going considering it clothed the whole family. My dressing gown is called the Ladies Super Soft Flannel Fleece Embossed Animal Dressing Gown, and it is the softest thing ever - literally like wearing a warm hug! 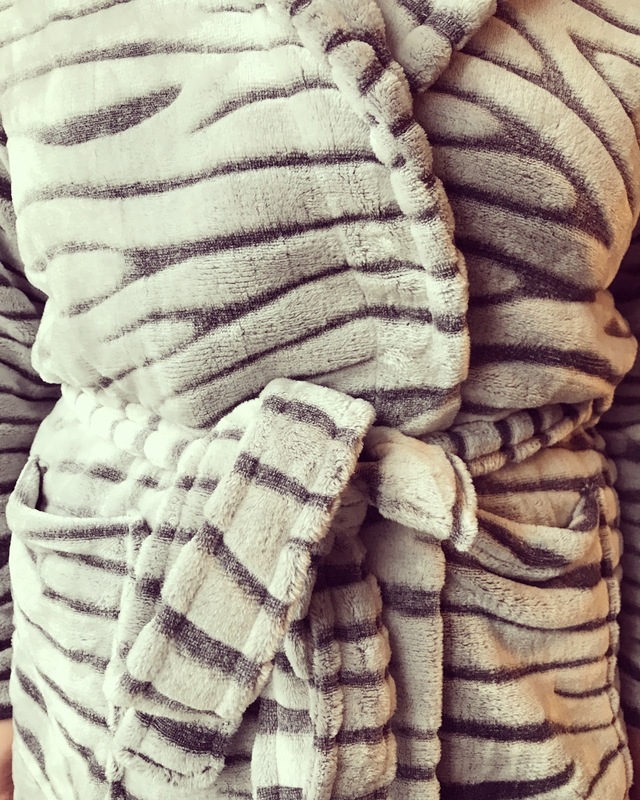 I loved that it features animal print (which I love and is so on-trend right now) but in quite an understated way - it's not the full-on Bet Lynch leopard print, but instead a muted grey tiger/zebra stripe effect, which, as the title would suggest is embossed into the fabric, giving it a gorgeous texture! It also has a hood, making it extra snuggly and warm, two pockets (which is so handy for mum life stuff - dummies, phone, tissues, snacks!) and a tie waist. 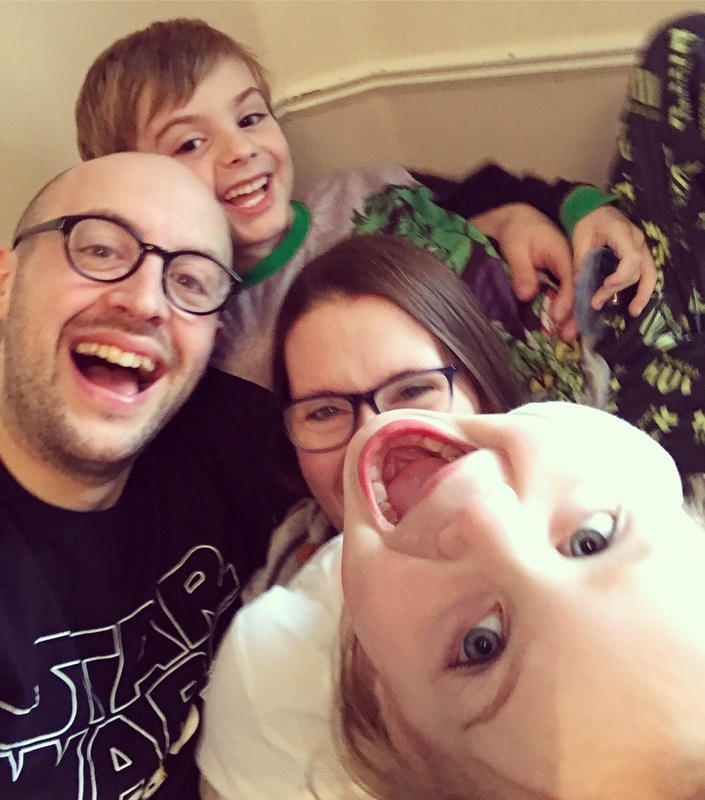 We had so much fun taking photos for this post - what is they say 'never work with children or animals'... it was genuinely like herding drunk sheep to try and get decent shots of everyone... here's a couple of outtakes to make you giggle! We were gifted the nightwear in return for this honest review. 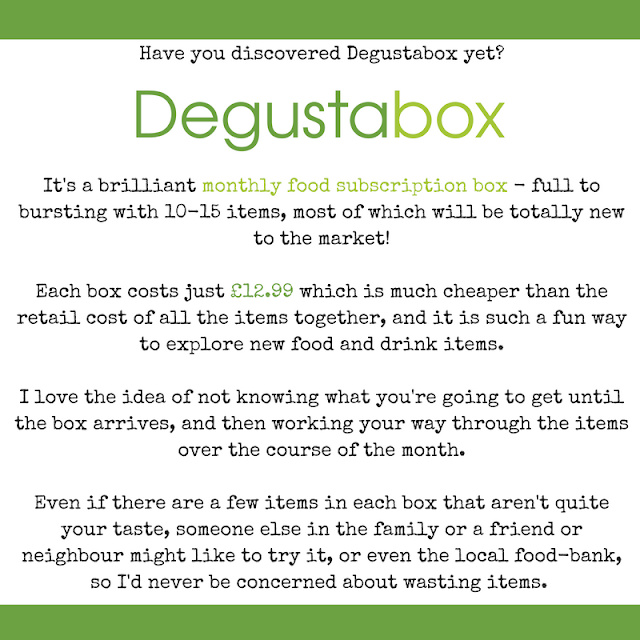 If you're considering a subscription gift for a foodie this Christmas, a Degustabox food box subscription is a brilliant idea. Keep reading to the bottom of this post for a discount code too! Amy’s Organic Soups start as vegetables, not as broth. We create our soup base by slowly sautéing tender organics vegetables with herbs. This modern method of making soup allows for the unique flavour of each soup to come forward. Here you’ll try two of our favourites! These soups are delicious!! They are really amazing quality and packed full of flavour. Tinned soup can so often be a bit of a let down for me, and I usually buy fresh soups, but I will definitely be looking out for these in the supermarket. A great speedy lunch or light dinner option. Get your crunch on with new Emily Veg Crisps Sweet Potato Sticks. Try classic Sea Salt with a sprinkling of salt over traditional yellow and bold purple sweet potato, or zesty Chilli and Lime with a beautiful mix of spice with sharp, tangy lime. I'm obsessed with these sweet potato sticks, Ive tried the other flavours before, and their fruit ranges, and I think they're so tasty. I love the super crunchy texture, and how they aren't oily, as normal 'crisp' style snacks usually are. What a treat! Anything from Jules Destrooper is always a luxury, and these thin little nutty biscuits were divine with a cup of coffee - they're really crunchy and chocolatey enough to feel indulgent in a delicate and refined way. Make mornings smooth with Weetabix on the go for kids. With four single serve pouches in a multi pack, you can be prepared for those busy on the go mornings. In three delicious flavours, a source of Vitamin D, calcium, fibre and protein. No artificial sweeteners, colours or flavours. 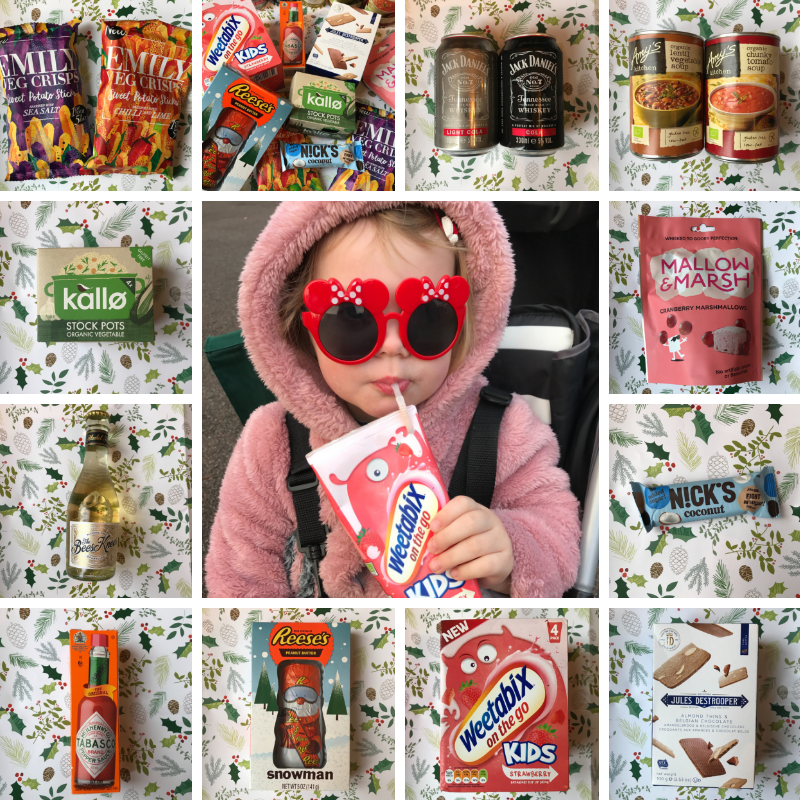 We gave these drinks to Connie (Bert doesn't like sweet drinks, always opting for water or milk), and she adored them, most often drinking them in the buggy on the way to take Bert to school, wearing her pink fur coat and sunglasses, that's how she rolls at the moment, haha, she's SO AbFab! The drinks are great to give kids out and about ('on the go', as the name suggests!) and it's great as a parent to know the kids feel like they're having a treat, but actually you know they are a source of goodness. Tabasco original Red Pepper Sauce celebrates its 150th anniversary this year. Tabasco Red Pepper Sauce is made with just three ingredients: red peppers, vinegar and salt. Tabasco is 0 calories and is vegan. Great added to eggs, stirred into Christmas Bloody Mary’s or mixed with mayo for a prawn cocktail. If you like spicy food, you'll already be au fait with Tabasco sauce - an absolute classic, and for me, a store cupboard staple. I add it often to soups, stews, curries and sauces, it is the perfect condiment for those who like their food fiery! N!CK’s Coconut is a rich and delicious naturally sweetened coconut bar coated with milk chocolate, with no added sugar. The perfect choice for a delicious guilt-free indulgence. We never add sugar in our products, not now and never! I think this was my favourite item in this months box - it is basically a posher, better quality and healthier version of a Bounty bar! Yasssss! I will definitely be buying more of these to enjoy as a treat - especially lovely as an afternoon snack/pick me up with a cup of tea. A great seasonal treat – a Peanut Butter filled Snowman with a chocolate coating. The perfect combination of chocolate and peanut butter. What a cute Christmassy treat! We've actually saved this to give to a family member who loves Reese's, we thought it would make a perfect little treat for her at Christmas time. A perfect mix of Jack Daniel’s old No. 7 Tennessee Whiskey & Cola and Jack Daniel’s Old No. 7 Tennessee Whiskey & Light Cola. Two convenient, perfectly mixed drinks whether you’re on the go or staying in with friends – best served chilled. These are similar products to the lemonade one's we tried in a previous box - the light cola one is delicious, and not too heavy on the calorie front, so this would definitely be my choice of the two. If you're a JD fan, these are super convenient and ideal for taking to parties over the festive period. TAKE STOCK OF ALL YOUR INGRDIENTS THIS WINTER AND GO ORGANIC WITH Kallo. Kallo organic vegetable stock pots are the perfect partner to enhance all your family favourite, home cooked delicious dishes. Natural, organic and no added MSG or artificial ingredients, they simply add delicious flavour and nothing else. I LOVE the Kallo stock products, and buy them frequently already - they really are one of the best quality stock pots available, and I'm pleased to have added the vegetable ones to my pantry! The ‘Bees’ is a sophisticated, vegan friendly alternative to sparkling wine. Made from grapes and infused with green tea, it offers floral aromas with refreshing acidity. It looks and tastes like a sparkling wine, but without alcohol, lower sugar, gluten-free and around half the calories of the average fizz. 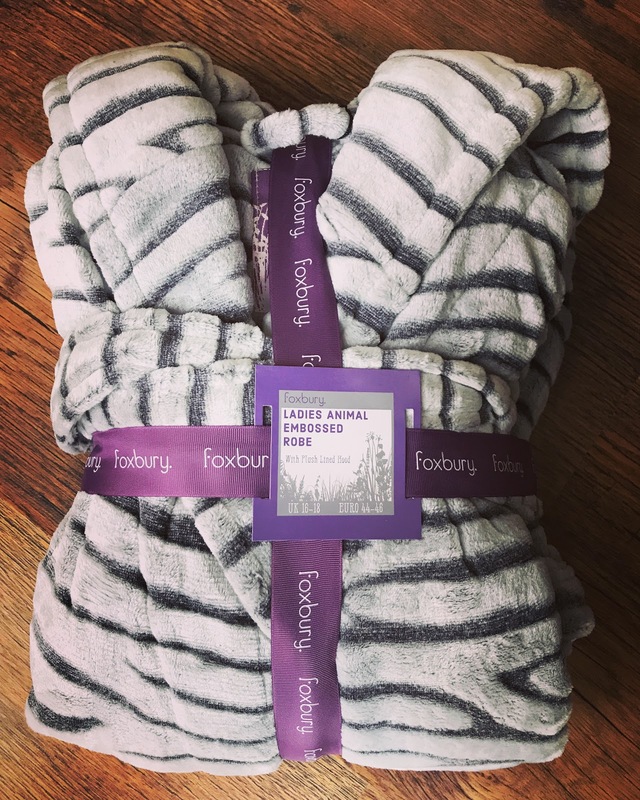 This is another thing I've squirrelled away, to give a pregnant friend when she visits over the festive period, it's ideal for those who don't/can't drink or are driving and will hopefully help them to feel less left out. What a great idea! Enjoy everyone and let me know if you try it! We were sent our November Degustabox in return for this honest review. 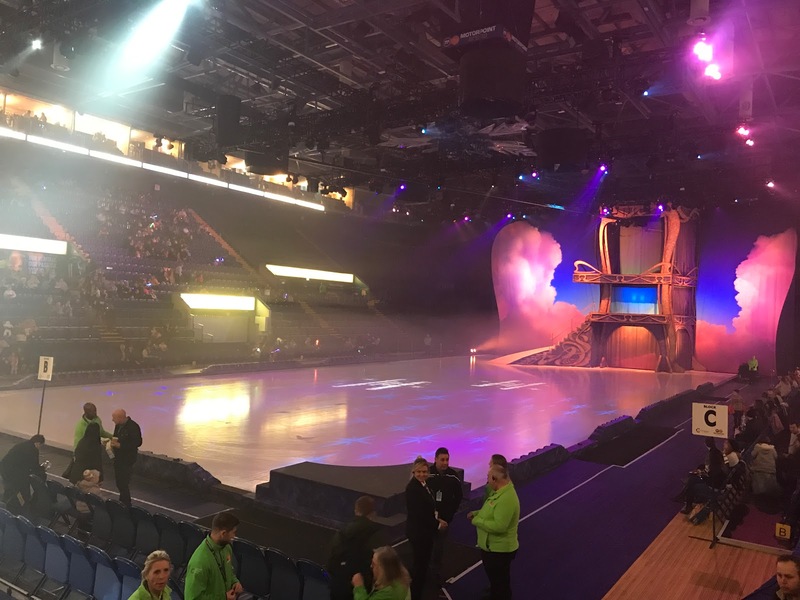 This weekend Bert and I took my best friend and her daughter to Nottingham Motorpoint Arena to see Disney on Ice presents Dream Big. 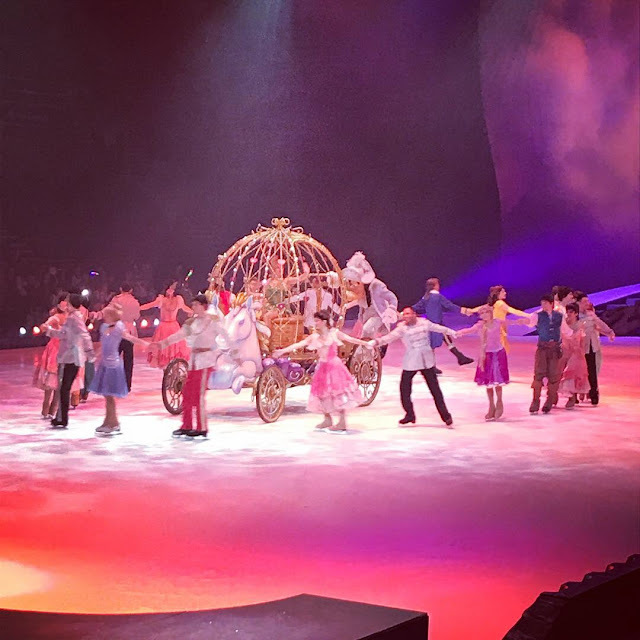 Back in April this year, Bert and I reviewed the Disney on Ice Worlds of Enchantment tour (read our full review here) and we were SO excited to be asked back to review their latest show. Excited besties all ready for a Disney On Ice adventure! 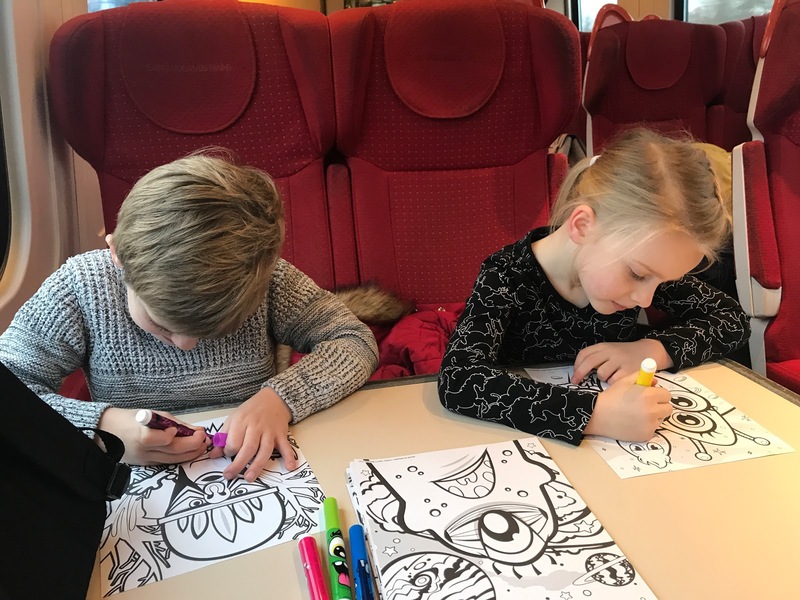 We jumped on the train from Bedford > Nottingham, which takes just over an hour: the kids love a good train journey, and of course, us mums had packed loads to keep them entertained, fed and watered for the journey. On arrival in Nottingham we took the short walk into town, and made at pit stop at the Golden Arches (about 10 min walk from the train station) to refuel before the 2.30pm showing. It takes about 15 mins to walk to the Motorpoint Arena from the town centre, and the doors open an hour before the show starts to allow plenty of time to get through bag checks, pick up some refreshments and merchandise, and get comfortable in your seats. 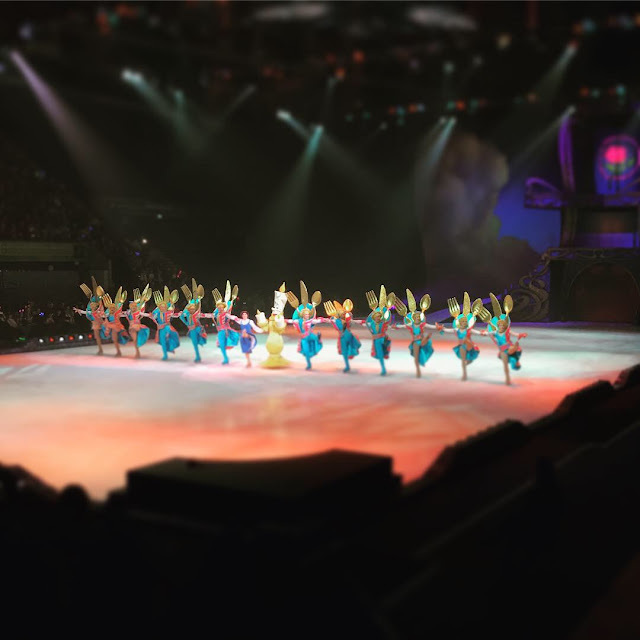 Having been to a Disney on Ice show before, Bert and I knew what to expect, and naturally our expectations were high after loving the show in April so much. 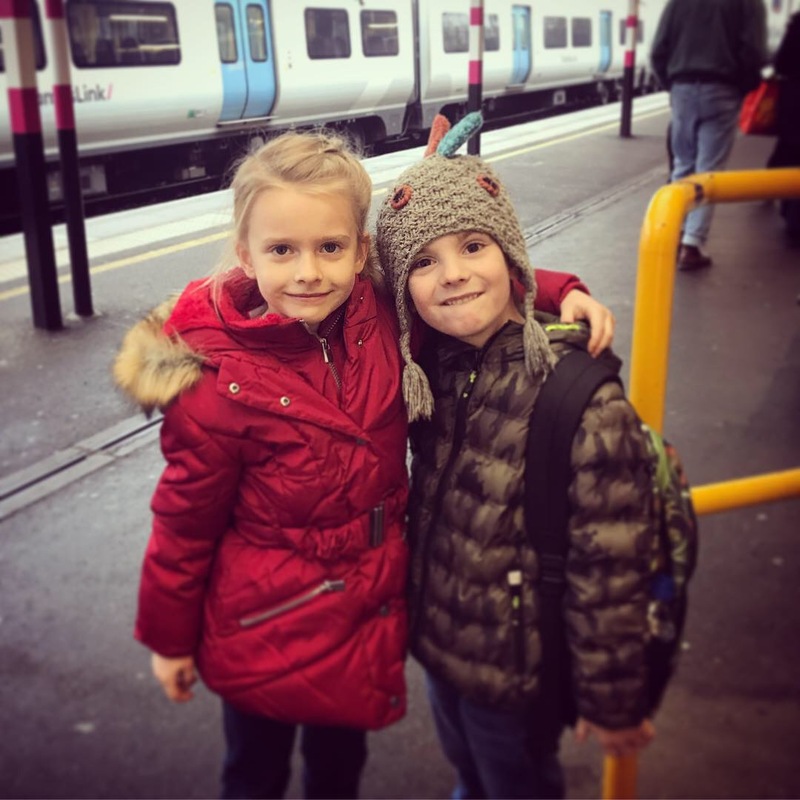 Our friends had never been before, so it was super exciting to see their reaction for the first time, and actually both us mums found it really emotional, watching the kids enjoy and share the experience together. Our seats were amazingly close, and gave us an absolutely brilliant view of the ice. The twenty minutes or so we spent in our seats before the show started were excruciatingly exciting for the kids, who asked every 2 minutes how long until the show started. 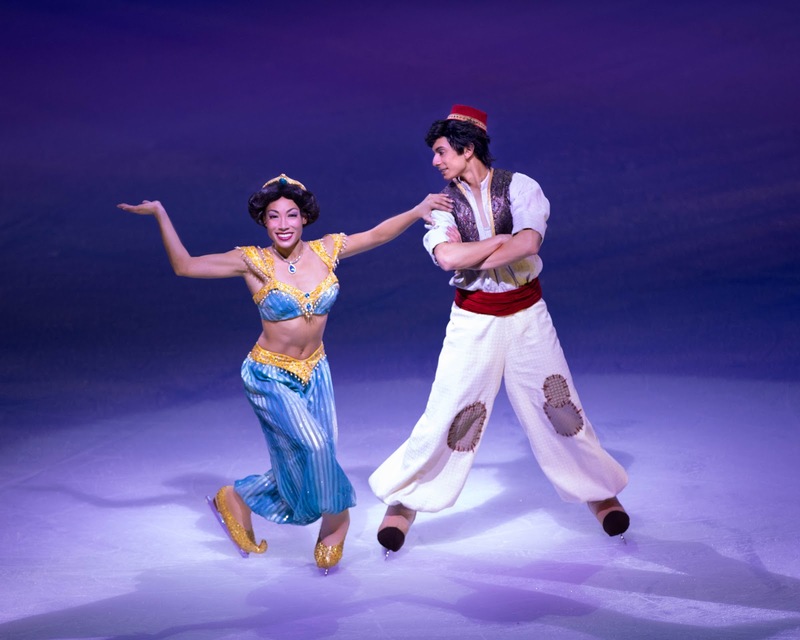 Disney on Ice presents Dream Big, is a celebration of 90 years of Walt Disney's 'true original' Mickey Mouse, and follows the key Disney princesses on their individual quests to follow their dreams. 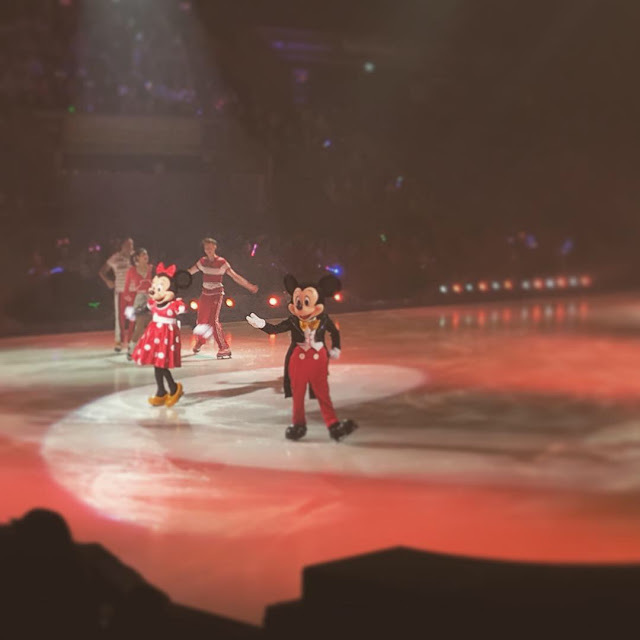 The show is opened by Mickey and Minnie Mouse in their true original forms, and they act as compares throughout the show, linking and introducing each scene to the stage. The main show starts with scenes from Aladdin - we're treated to versions of 'One Jump' in the Agrabah marketplace where we meet Aladdin and his pet monkey, Abu, shortly followed by meeting the famous Genie for a rendition of 'Never Had a Friend Like Me', the Aladdin portion of the show closes with a beautiful version of 'A Whole New World' where we watch Aladdin and Princess Jasmine fall in love, swoon. The Genie granting Aladdin his first wish! Next up, was my all time favourite 'Beauty and the Beast' where we meet Belle, Lumiére and the dinnerware who present the epic 'Be Our Guest' - this was a real showstopper! Belle, Lumiére and the dinnerware! 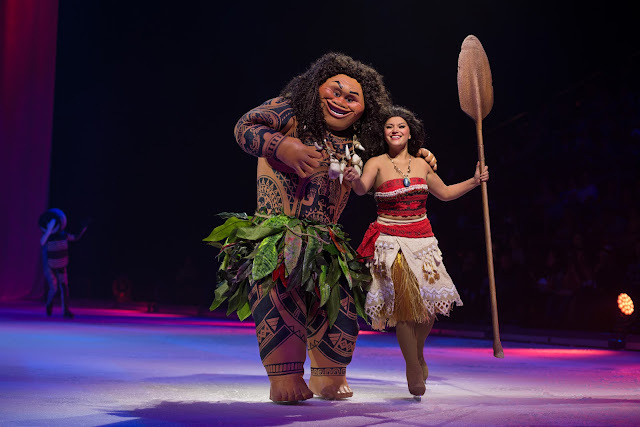 Then we join the fearless Moana and the greatest demigod that ever lived, Maui, on an action-packed voyage to restore the stolen heart of Te Fiti. Moana is a favourite with our kids, so they were so thrilled to see them so close up and re-experience their favourite songs from the show. 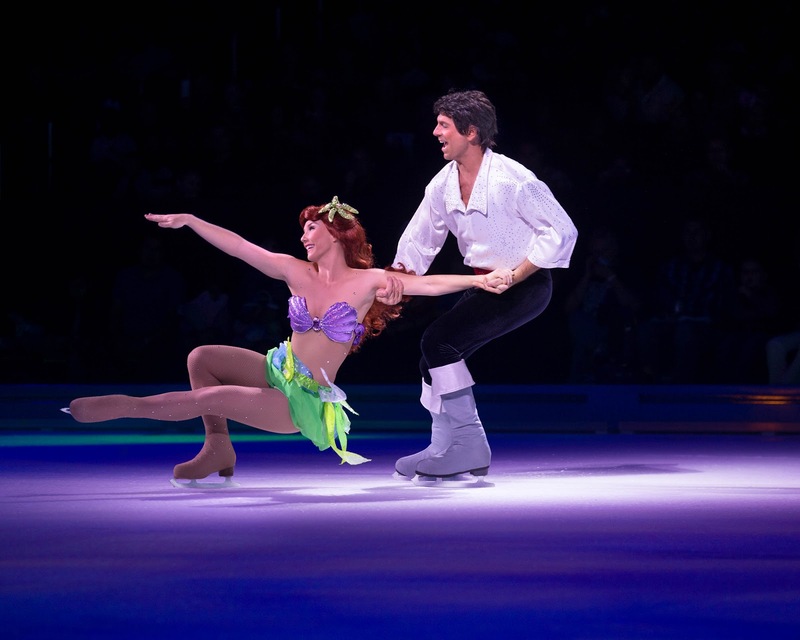 It goes without saying that the ice dancers are so unbelievably talented, the grown ups watched on in total awe! 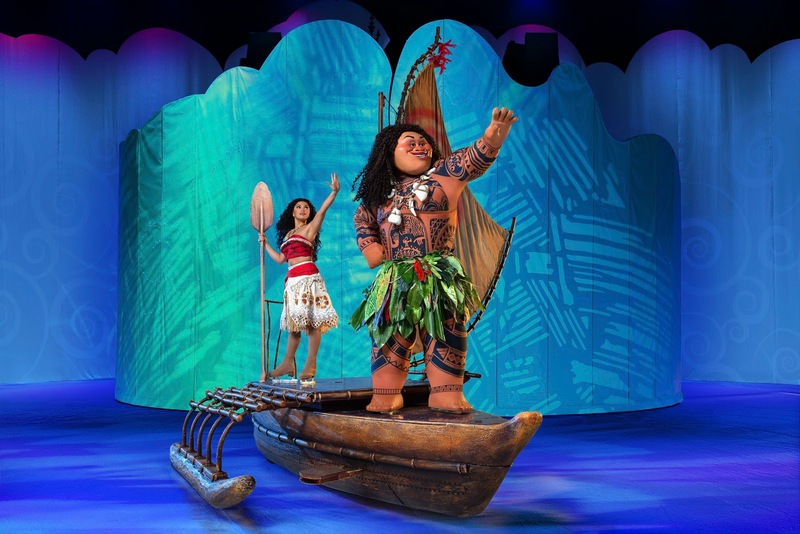 Beautiful Moana: we had such a great view of a corner platform where so many of the cast would stand and wave to us during the show! Following on from the Moana showcase you get tangled up in Rapunzel’s hair-raising quest to see the floating lights, the scene includes the beautiful duet between Rapunzel and Flynn Rider called 'I See the Light' from the film 'Tangled'. Truly awe-inspiring and hair raising/tingle inducing stuff. 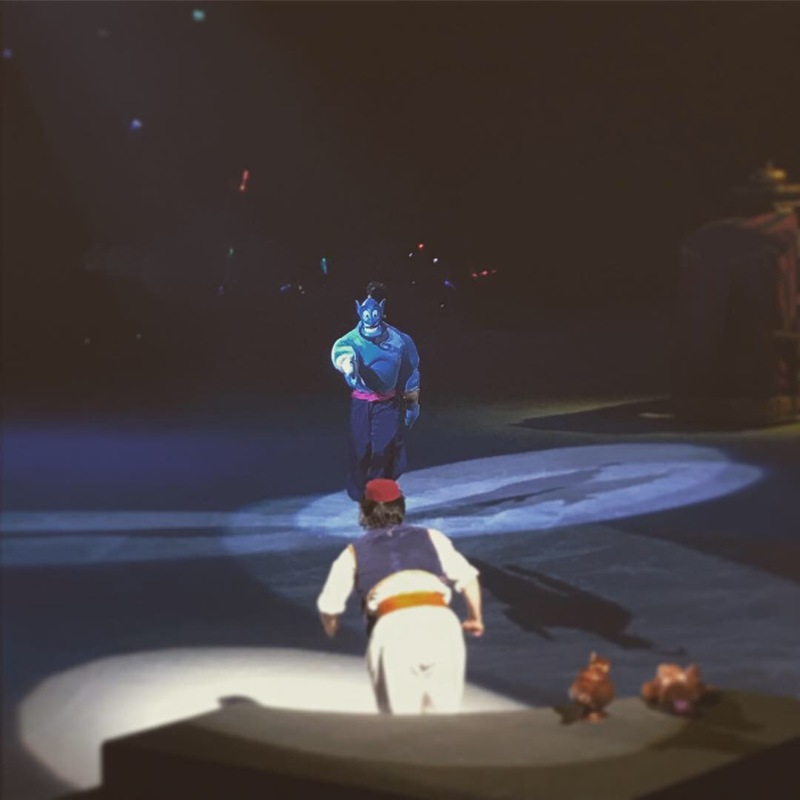 The first half of the show closes with an excellent segment featuring the characters from 'The Little Mermaid' including Ariel, Flounder, Sebastian, Ursula, Prince Eric and more. 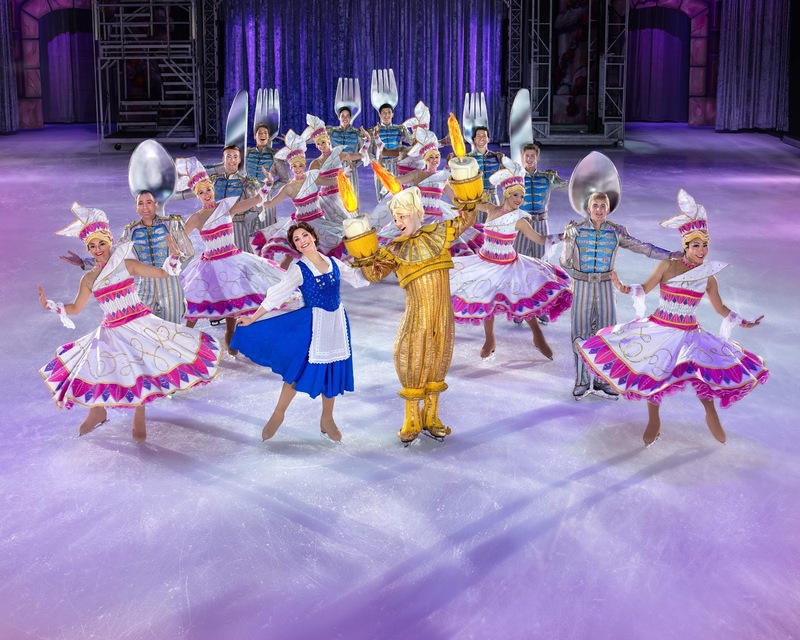 This is a real showcase of the film with lots of the main 'numbers' included, as well as beautiful array of colourful and bright costumes which fill the ice: the stage is so full and exciting that you genuinely don't know where to look! There's a short interval to refuel, nip the loo etc before we are transported back to magical Disney lands. 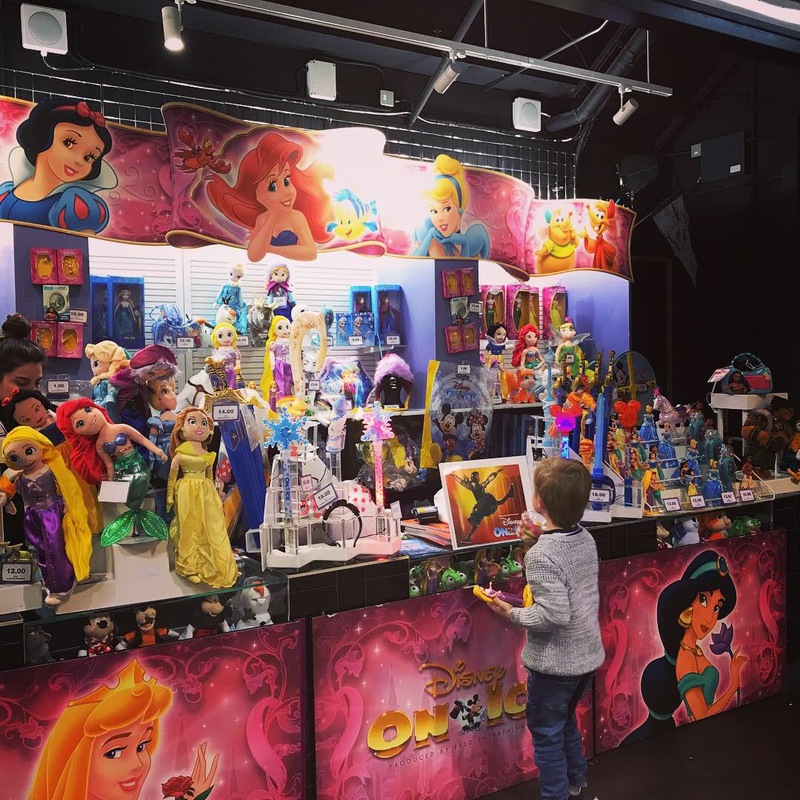 We set the kids limit of one piece of merchandise each as a memento of their day, and they both chose large Disney Princess figures, priced at £12 each. Bert chose Rapunzel and his friend chose Ariel. They clutched them throughout the show, and it was really lovely to watch them reenact the show on the train home with their new toys. Will you just look at their excitement? 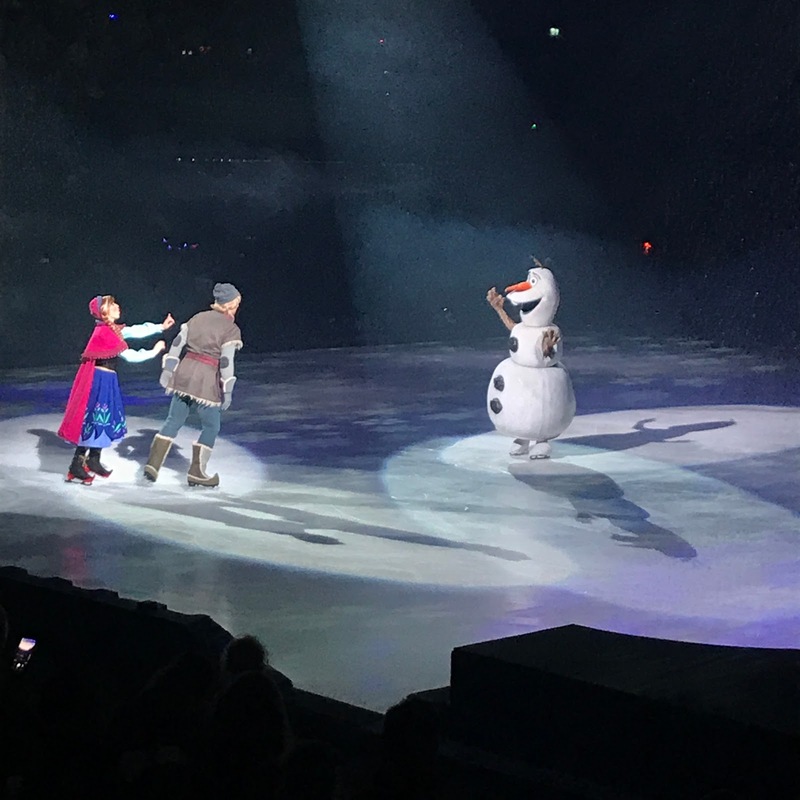 The second half of the show sees us travel to mountainous Arendelle with Anna, Elsa and Olaf in a dramatic retelling of the sisterly love that saved a kingdom. This section is a really special part of the show - the light work, set, and special effects including fire, pyrotechnics, bubbles and snow are really breathtaking and only make the experience even more magical for the audience! 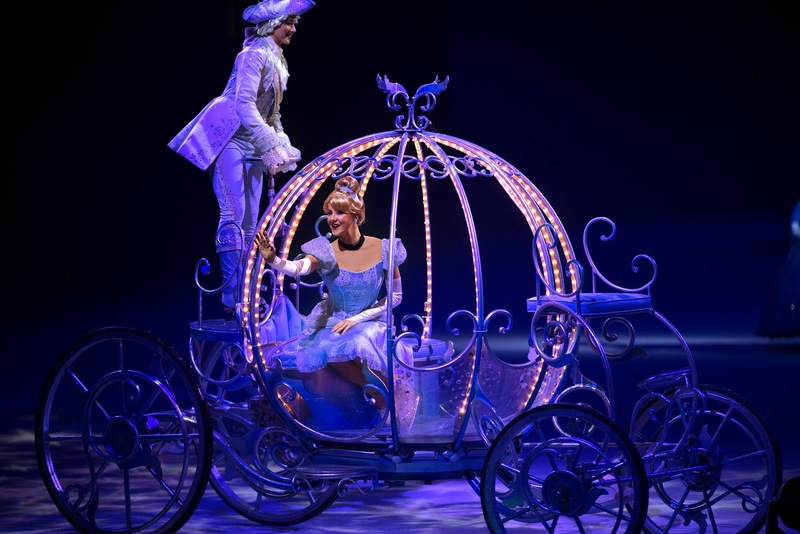 The close of the show uncovers the strength, bravery and kindness that inspired generation after generation with a celebration of Jasmine, Ariel, Aurora, Belle and Cinderella. What a line up!! 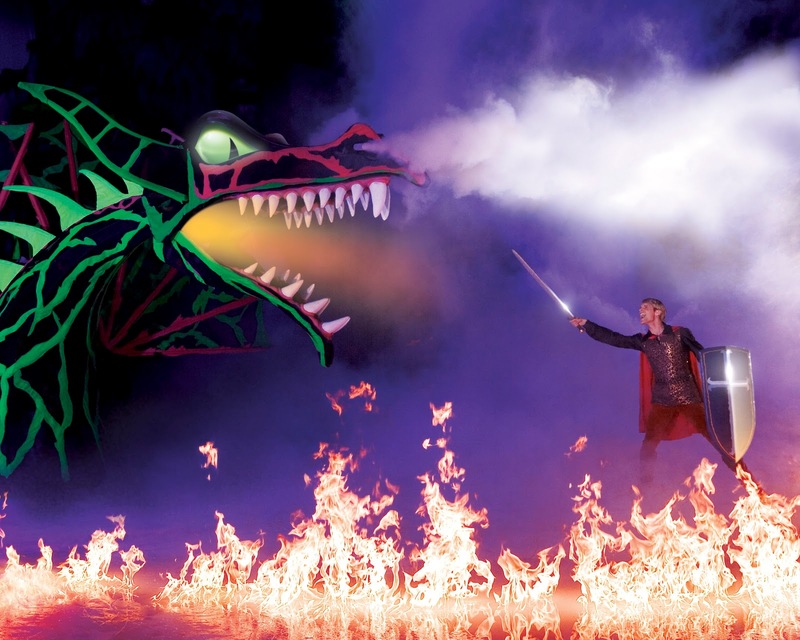 The Dragon, Prince Philip and the fire!! 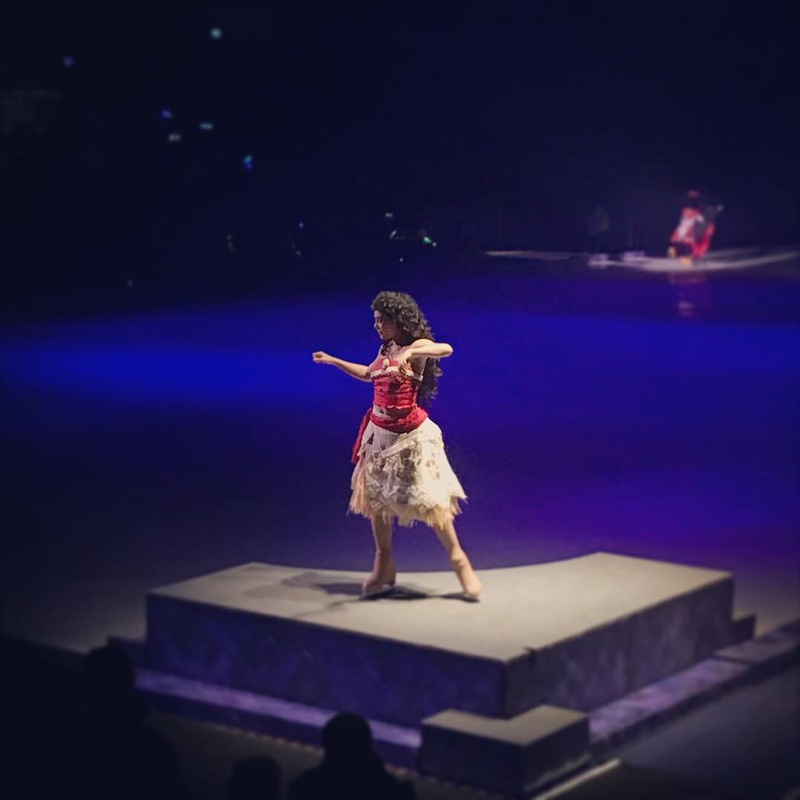 What always strikes me most at Disney on Ice shows (aside from the incredible talent of the ice dancers) is the detail of the costumes and set pieces. All of the characters are instantly recognisable, and the costumes are all absolutely exquisite, but still suitable for ice dancing - which is no mean feat. In this show they seemed to have gone all out with set including Cinderella's amazing coach and an actual fire breathing dragon from Sleeping Beauty! Seeing the kids' faces when these appeared on stage was truly priceless. We had the best time, and my friend and I felt quite emotional about the whole thing, vowing we should make time more often to fit in these lovely treat days with just our elder two children (who also happen to be best friends and in the same class at school, handy that!). We were not disappointed by the show at all, and we sang and danced our way back to Nottingham train station on a real high. 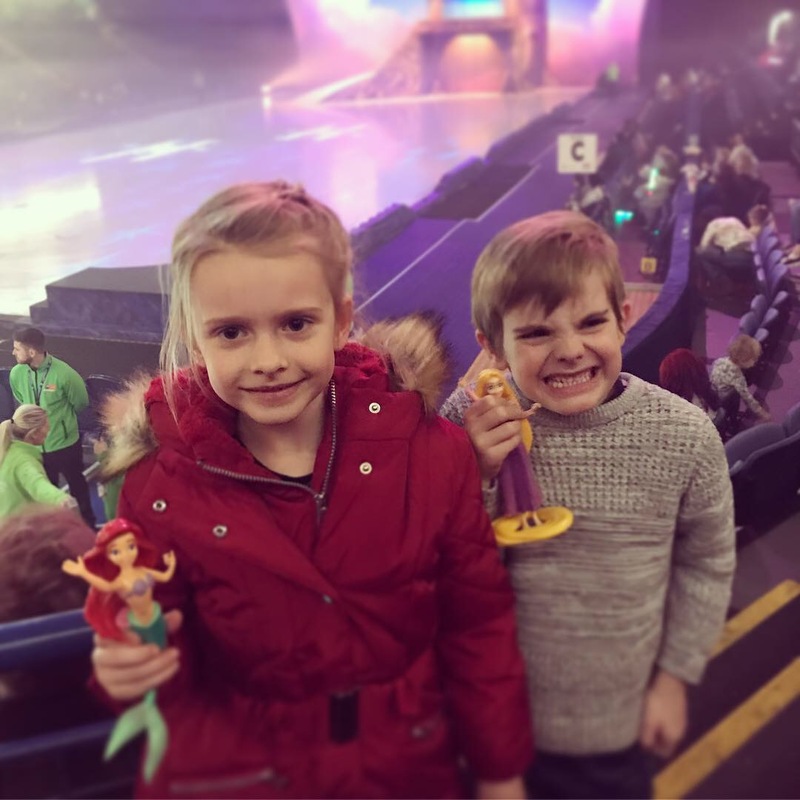 The Disney on Ice shows are truly a wonder to behold - they appeal to such a vast age range (there were newborns and young toddlers, as well as school aged children in the audience) and honestly, all of the adults were having an amazing time too - it really is a treat for the whole family! 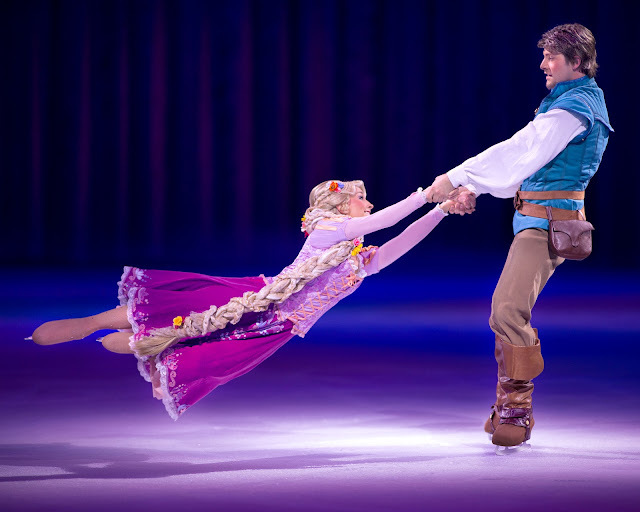 Disney on Ice presents Dream Big is in London at the O2 Arena from 26.12.18 - 06.01.19. 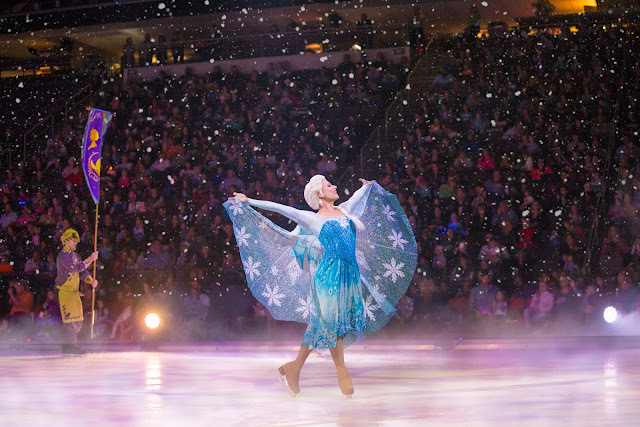 We were given complimentary tickets to Disney on Ice in return for this review post. All views are our own. 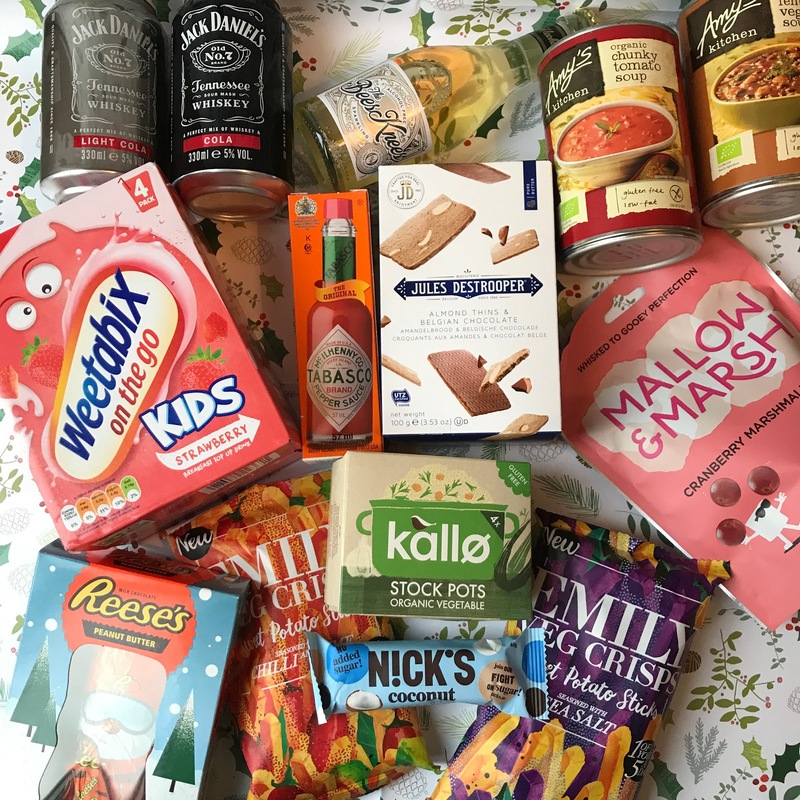 What was in our October 2018 Degustabox + discount code! Our Classic Lemon flavour tea is a favourite for many. Enjoyed hot or cold, this refreshing beverage excites the taste buds with a combination of sweet and citrus flavours. OMG! I am officially OBSESSED with this stuff - it's so warming and delicious, perfect for autumn winter & only 22 calories per mug. WIN! I will be buying this as a staple part of my weekly shop from now on. Introducing KITKAT Chunky Salted Caramel Fudge, an exciting, indulgent, salty sweet taste sensation! Unwrap, snap off a chunk and enjoy the delicious smooth milk chocolate and crispy wafer with a caramel fudge flavoured topping of KITKAT Chunky Salted Caramel Fudge. Hubby devoured it and said it is the best flavour yet - and that's high praise! The peanut butter one is now a close second. The Heinz Creationz range comes in four delicious world flavours, Spanish, Italian and Mexican Beanz as well as Lentil Curry. Perfect for talking to work for a quick lunch, or as a tasty and speedy addition to your dinner. I love these quick pouches - and have actually already tried quite a few of the Heinz Creationz - they are a really good quick dinner (on toast, jacket potato etc) or a side dish, lunch option or even breakfast addition. Quick, easy, no mess, no washing up, and super flavour and quality, which I've definitely come to expect from Heinz. Jack Daniels’s Tennessee Honey & Lemonade is a refreshing mix of Jack Daniel’s Tennessee Honey and zesty lemonade. A convenient, perfectly mixed drink for whether you’re on the go or staying in with friends. The ultimate summer cooler, enjoyed all year round. My brother and I both love a JD, so I'm saving these cans for when he next comes to visit - they're so handy to keep chilled for when guests come over, or to keep on hand for an evening treat. I like that it's a perfect serving, all measured etc. Enriched hydration for strength, energy and mental performance. Zero sugar, low calorie and real fruit flavour. Hubby and I both weren't keen on these before - you'll know what I mean when I say they had a really strong vitamin taste, and were super sweet for my taste buds. That being said I am a soft drink purist, preferring plain water most of the time - I don't even like squash! Santa Maria Latin American Kitchen cooking sauces, for a delicious meal, ready in 15 minutes! Pour the sauce over your cooked meat, fish or vegetables for fantastic Latin American flavour. Santa Maria cooking sauces are Vegan friendly and Gluten free. We are using this sauce on Sunday night for dinner & I'm looking forward to trying it - Mexican cuisine is one of our favourites here at Chez Bishop - and we are big fans of the Santa Maria Latin American Kitchen brand - in fact, I actually look for this brand above all others when it comes to these types of cooking sauces now. Award winning Moist Mixed Berry Bar. Made of real fruit and gluten free wholegrain oats, baked to perfection with absolutely no artificial ingredients. No added cane sugar, vegan, gluten free and a great source of Fibre. Bert enjoyed this fruity bar, he said it tasted like a super fruity flapjack - I liked that he felt it was a treat snack, but I actually knew it was a healthy source of fibre and wholegrain, with no added sugar! Mum win! Ginger Beer by Supermalt is made using real ginger extract, and a delicate hint of lemongrass to give it a truly refreshing drink with an energising fiery kick. Best served ice cold. Enjoy as a full flavour soft drink or as a mixer for your favourite cocktails. 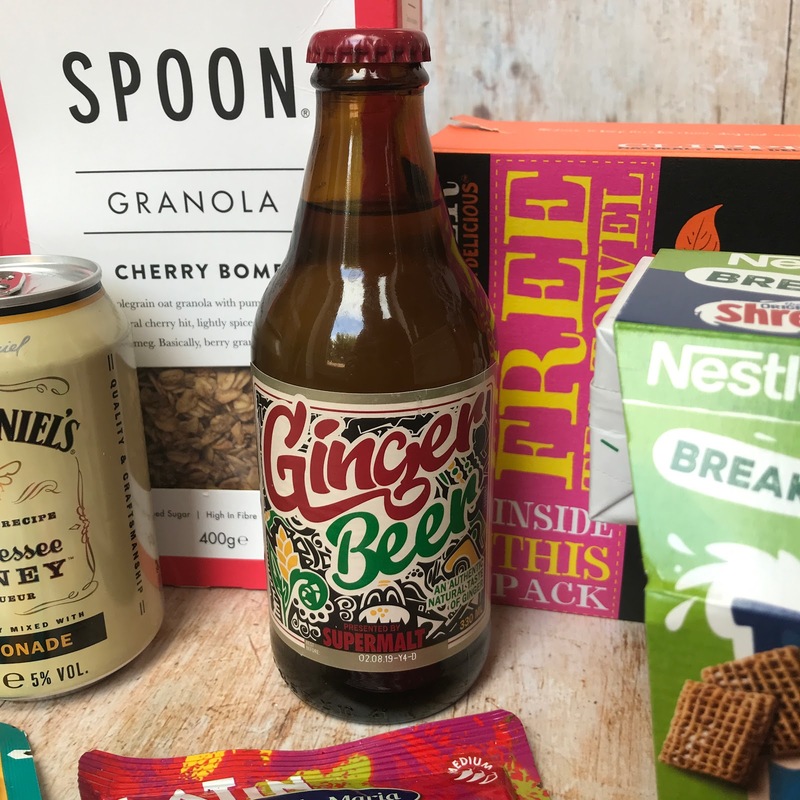 I love ginger beer; my mum likes to tell me it must be because she had a craving for it throughout her twin pregnancy with me and my sister (!) This Supermalt branded ginger beer was lovely - very fiery and great served with my marmalade gin! I also adored the packaging/branding, it looked so cool. Our delicious Fairtrade Tea is big, bright and bold, delivering a quality cup of tea you’ll want to come back to again and again. All Clipper products are made with pure, natural ingredients and a clear conscience. You also have a lovely Clipper Fairtrade tea towel included in your pack! Ahhh tea - I fell out of love with it when I was pregnant with Connie, but prior to that I was a massive tea drinker (5+ cups per day). In the last few months I've really started to get into it again, so I was chuffed to get a lovely box of 'posh tea' in this months box. I was thrilled with the added bonus of a lovely new Fair-trade tea towel too! Thanks Clipper! PS. Clipper makes FAB-U-LOUS tea! 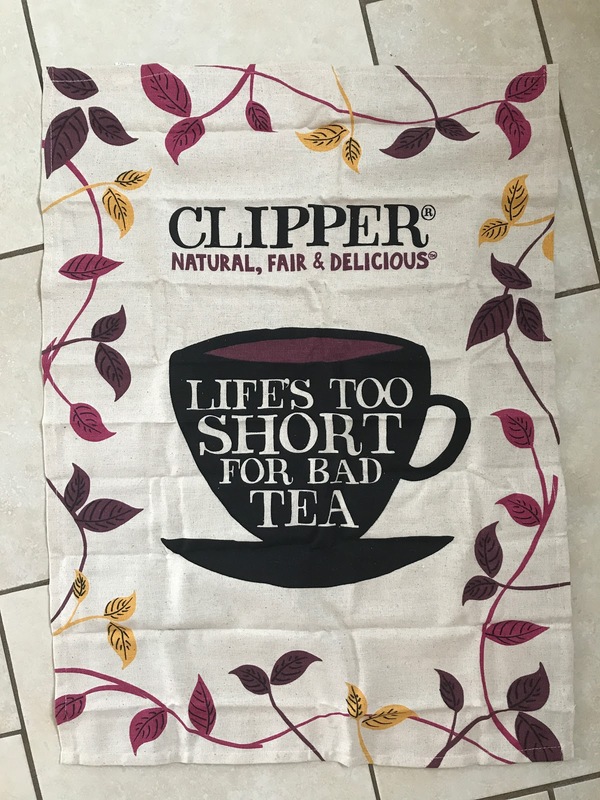 Super cute Clipper tea towel! A new, all-in-one Nestle on the go solution coming with a portion of Shreddies cereals and a carton of milk. Packed in a recyclable cup with a spoon, simply pour the milk on the cereals and you’re ready to eat in seconds. The excitement when Bert clapped eyes on this - why do kids love a gimmick so much? Essentially it's a mini pot of Shreddies with a carton of long life milk and a spoon, so you can have cereal on the go. Of course, Bert ate it on the living room floor, but he's never really in need of breakfast on the go, let's be honest. I can see that it could be useful for commuters/office workers I guess...but a bit gimmicky for me! Toasted oats with ground almonds, pumpkin seeds, freeze dried cherries, honey, maple syrup and a dusting of ground cinnamon and nutmeg. No refined sugar. High in fibre. Wholegrains. Making breakfast better. No small talk before breakfast. No artificial colours, flavours or preservatives. Suitable for veggies.Wholegrain oat granola with pumpkin seeds and a natural cherry hit, lightly spiced with cinnamon and nutmeg. Basically, berry granola but better. What Our granolas contain a short list of high-quality ingredients, like pure Canadian maple syrup, which tastes awesome and is packed with more antioxidants and nutrients than refined sugars. Not rocket science. But tastes out of this world. If you've ever read a Degustabox post from me before you'll know that A) Breakfast is my favourite meal of the day, and B) I am OBSESSED with granola. I eat it almost every day, with full fat coconut flavour yoghurt from Aldi, and fresh fruit, with a tiny squeeze of honey, and I look forward to it every morning! So I'm always THRILLED to find a new granola to try. I've never eaten a SPOON granola before, but this one was truly delicious. I'm still finishing off the box, but I've had it daily since it arrived two weeks ago. It has a subtle cherry flavour with a big hit of warming almost Christmassy spices, and a nice fine consistency (not clusters). I would happily buy this again and again, especially in autumn/winter. 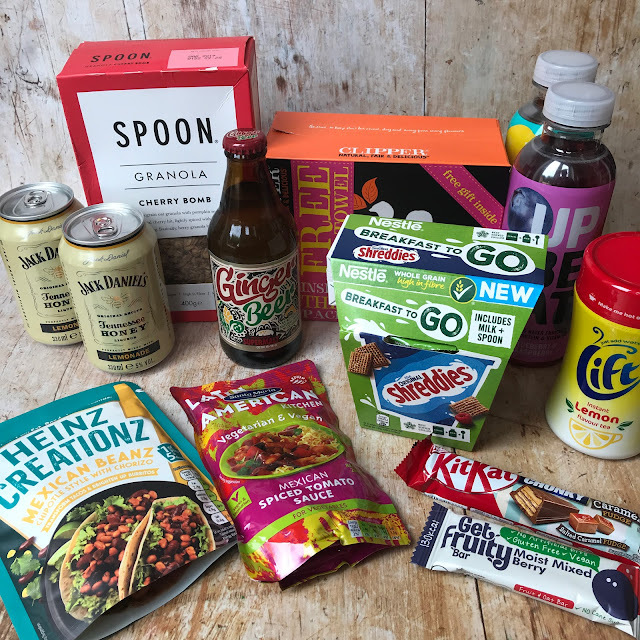 We were sent this Degustabox in exchange for our honest review.